Let the mind put it together: How Gestalt theory can help city planners reverse fragmentation. Recent efforts to reconnect urban spaces divided by infrastructure include the creation of parks in underutilized spaces, for example, by making use of the space under elevated highways or by covering sunken highways. Industrial waterfronts and yards are also being reinterpreted and turned into promenades and linear parks. This requires the redirection of traffic and the coordination among different stakeholders, government agencies and institutions. This is often only possible under a long-term, comprehensive planning approach. A tactical approach is often the only alternative. Bonaventure Park in Montreal. This project reconnected spaces otherwise divided by an elevated highway in downtown Montreal. The project entailed the coordination between provincial and municipal governments as well as with CN. Description: New Robert-Bourassa park. Author: Mtlfiredude. 8 September 2017. Registered under Creative Commons 4.0 License. Available in Wikimedia Commons. What are the consequences of not solving fragmentation in the short and mid term? Fragmentation affects the quality of life in many ways. The spaces adjacent to the infrastructure lines are under-maintained and inaccessible. Pollution, noise and abandonment discourage people from crossing or walking along these spaces. They also create "sinuosity." That is, the pedestrian is forced to take sinuous ways to go around elevated or sunken highways to go to places that are otherwise close in a straight line. What can be done when no significant reconstruction is possible? There are several alternatives that, even if they don't effectively reconnect the territory, can alleviate the sense of disconnection. Here, there are two important aspects to considerate. First, the fact that urban experience works independently of factual urban space. That is, we imagine the territory regardless of how the space is constructed. Kevin Lynch (1960) explored this idea throughout his work. Our mental (or cognitive) map of the territory differs from architectural representations of it. The legibility of the space is key to improve the quality of life in urban spaces. Our sense of connection goes beyond the actual disconnection. Second, we should not forget that most urban territories are now actually and effectively linked by intangible and virtual flows. Communication, exchange and information in the internet flow across divided territories, thus connecting them virtually. This is a fact that we might take for granted but before the internet, the telephone and the telegraph, physical walls could actually seal a city from the outside world. Having said that, there are three main alternatives to physical reconnection of fragmented urban spaces. (1) Tactical stitching, (2) Appropriation of the edges, and (3) conceptual reconnection. Tactical stitching entails finding key spaces (or "holes") that can serve as corridors to link spaces across the infrastructure lines, thus creating legibility across the space and linking the space cognitively. Appropriation of the edges entail intervening the edges created by infrastructure. Community gardens, pocket parks and murals are some examples of how communities reappropriate infrastructure and improve the quality of life in communities. However, here I want to focus on the latter. Conceptual reconnection is by definition abstract, and it entails the creation of conceptual totality in the minds of the users. This is a provocation that result from brainstorming session and community charrettes after 4 years of testing methodologies of participatory planning in my Urban Laboratory studio in Montreal. Interesting ideas have come out of the process of thinking out loud about the topic of fragmentation. Some ideas where never implemented in our projects, but provide interesting images to reinterpret fragmentation. For example, in one occasion a group of students suggested the idea of putting phone booths in different spots of the city that could be used to create conversations with anonymous and random citizens. Another idea was to project images from one side into a surface on the other side of the infrastructure line, as well as shooting light or lasers into the sky that were visible on both sides. 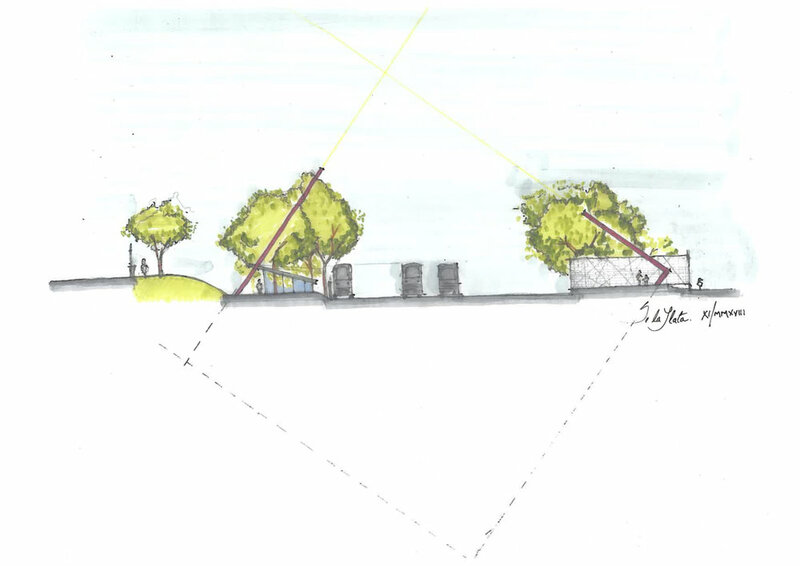 In a recent exercise to reconceive a small park in Montreal a latent provocation has arose. The park is very complex site. It is located in the intersection of a bike path, a bus terminus and a train station. It is adjacent to the rail tracks. And, there are community spaces across the rail. This inevitably suggests that, given that a physical reconnection of the fragmented territory is not feasible in the short or mid term, a conceptual reconnection is possible. This is where Gestalt theory can be helpful. Examples of Gestalt Images. In this images, the observer completes images out of void spaces. They create the illusion of a triangle (A), a tube (B), a sphere (C) and a liquid surface (D) even when none of these images are actually drawn. This approach can be helpful when considering that fragmentation creates voids in the city fabric that can be conceptually connected. Description. Author: Albert Kok, assumed (based on copyright claims). 7 February 2007. Registered as Public Domain. Available at Wikimedia Commons. Gestalt is a theory that was mainly developed in psychology, but that has influenced numerous disciplines including design. Gestalt departs form the idea that there is a general overarching background that structures our mental reality. We tend to fit different elements of it according to that structure. This becomes particularly interesting when considering elements that might be missing in the mental structure. Our mind tends to complete the missing spaces and construct a toto. This is a strategy that can help in creating legibility in a fragmented territory. In a fragmented space, there are gaps that separate the totality of the territory. Therefore, if we create structures on both sides of the gap that create a conceptual totality, the user will hypothetically tend to put it together. The possibilities for this strategy are endless. Architectural pieces, sculptures, textures, surfaces can be designed as complete across the rail in order to create an idea of totality. Project Idea for Coffee Park in Montreal. This image shows an example of Gestalt Theory as an urban design tool. Here, the two structures are located on both sides of the rail tracks and are constitute fragments of square. Both structures also shoot light and intersect above the rail. The observer completes the image and that creates a cognitive connection even when there is none at the material level. Source: Author: Silvano De la Llata. 10 November 2018, Montreal, QC. Urban space is a text. In the same way that we read a text and can understand a concept by context and can sometimes skip a paragraph or a page without loosing sense of the general, we can create a general concept for the space that the "urban reader" can make sense of even when the space is physically fragmented. Project Idea for a public space in West Haven Community (across Coffee Park) in Montreal. Here, A public space is projected in an alleyway to link the bakery and the community center. The sculpture connects conceptually with its counterpart on the other side of the rail tracks. Source. Author: Silvano De la Llata. 10 November 2018, Montreal, QC. Lynch, K. (1960). The image of the city (Vol. 11). MIT press. Urban fragmentation is arguably the most pressing issue in urban design and physical planning in postindustrial cities. After two centuries of implacable urbanization cities have inherited massive lines of infrastructure that divide neighborhoods otherwise connected. Railways, expressways and industrial yards were traced with no regard for everyday urban life and communities. At the same time, this also effectively connected cities regions and complete continents in ways that would have been unimaginable. This is one of the great paradoxes of contemporary cities: connection at the large-scale creates disconnection at the community level. Therefore, fragmentation is not only a problem of the urban form but also a problem of scale. To make matters more complex, we have inherited infrastructure that is not only massive but often times have become obsolete, underused or just abandoned. Infrastructure such as elevated highways, multi-level vehicular intersections, (post)industrial complexes, railroads and railyards as well as on small urban spaces in parks, plazas and service alleyways often create interstitial spaces. The interruptions that these spaces create in the urban fabric are not only due to their physical condition, but also because there is a difference in the social, spatial and institutional scale. These spaces are often under national or provincial/state government jurisdictions (i.e. highways and railroads) or even transnational regulations (i.e. international corporations), and therefore are detached from community and neighborhood-level dynamics. Seen from the sky these structures really look like "wounds" in the urban tissue. This analogy of the city as a body is helpful to rethink fragmentation. Urban fragmentation created by an interchange in Chicago. Overhead photo of the Circle Interchange in Chicago, IL. Source=self-made |Date=August 12, 2006 |Author= Stratosphere. Image registered under Creative Commons 4.0 license. The question is: Is fragmentation reversible? Can these "wounds" and "scars" actually heal? Is there a way to "re-stitch" the city? The answer is yes. However, is it feasible? Yes, but not always. There are technical, financial, political and jurisdictional challenges to reconnect fragmented landscapes. In the last ten years, cities across the world have substantially invested in reconnecting urban space. However, most of them use “major-surgery-like” interventions that require large demolitions and reconstruction of existing infrastructure. Celebrated projects such as The New York Highline Park, The Cheonggyecheon Stream Park and Seullo 7010 in Seoul completely reinterpret infrastructure lines and turn them into vibrant public spaces. Such projects are strategic interventions in the territory. That is to say, they are conceived with a large-scale and long-term approach. But the reality is that most cities cannot afford projects of such scale. However they can opt for a tactical approach (small-scale and short-term interventions). Urban re-connection through the reinterpretation of infrastructure in Seoul. Cheonggyecheon stream. Author. Francisco Anzola. Transferred from Flickr via Flickr2commons. Available in Wikimedia Commons. 15 April 2014. Seoul, S. Korea. Registered under Creative Commons 2.0 License. Following the analogy of the city as a body, "urban acupuncture" (Lerner, 2014) is an alternative to major surgery. Urban acupuncture are mild interventions that can turn the socio-spatial dynamics around in the urban fabric. This is not to say that the reconstruction of infrastructure should not be considered as a solution -- like in Medicine, sometimes surgery is the only way to solve the problem -- but that we should consider a gradient of options between the two approaches. Depending on the financial, technical or political feasibility, city planners can choose different strategies as alternatives to the full reconstruction and transformation of the infrastructure. Interventions such as graffiti murals, art installations, farmer markets, community gardens, and events such as festivals, concerts or neighborhood meetings are examples of mild interventions to reconnect fragmented territories. In these cases, the urban tissue is not fully restructured, rather the edges are improved through community reappropriation, scattered stitches are located in strategic spaces in the infrastructure lines or, if none of these is possible, artistic projects are used to connect the space conceptually. In all these cases, the first step is a creative reinterpretation of the site to provide a good diagnosis that leads to an effective intervention. Chicano Park in San Diego is an example of a tactical intervention in an elevated highway. This murals were made by Mexican-American Activists during the occupation of the space in the 1960s. Description: Chicano Park Murals. Author: Kellinahandbasket. August 10 2006, San Diego, CA. Registered under a Creative Commons 2.0 license. Available in Flickr. *This blogpost borrows largely from the Syllabus of Urban Laboratory (URBS 333) (De la Llata, 2018). De la Llata, S. (2018), Urban Laboratory Syllabus, Studio course taught in the Department of Geography Planning and Environment at Concordia University. Lerner, J. (2014). Urban acupuncture. Island Press. 'Where is planning in all this?' was a recurrent question I received when I presented my  research on the square movements of 2011, 2012 and 2013 in urban studies, geography and planning conference. The occupations of Tahrir Square, Plaza del Sol and Catalunya in Spain, Zuccotti Park in New York, and Taksim Square in Istambul developed open libraries, kitchens that fed thousands every day, community gardens, art workshops and film screenings. They hosted open-to-the-public assemblies, teach-ins and open conversations to discuss the economy, gender, social change, the environment and the media. They cooked with solar stoves, built structures with recycled wooden skids and used bicycle-powered sound systems in their general assemblies. Here, it is difficult to recognize a hierarchical order but it's impossible not recognizing planning. However, the experience of the protest encampments makes us reconsider planning and think more about citymaking as a broad process of design, use, regulation, interpretation, representation, imagination and, of course, urban planning. The experiment of the square movement has passed. But the impetus to create citizen-driven, citizen-led and citizen-responsive cities is very much alive. The project Cities X Citizens draws from the experience of the square movements and builds on critical planning and design methodologies, such as pattern language design, placemaking, open-source design and community charrettes to explore avenues to democratize citymaking broadly. Two methods were developed as a result of this process: planning-in-situ (i.e. planning the space from the space itself) and open planning (i.e. opening citymaking processes to online and offline participation). These methods have been tested in different public spaces in Montreal (e.g. NDG Park, Kent Park, Alleyway Bishop/Mackay) and are in itself a work in progress. Therefore, they embrace a transformative spirit and evolve based on the inputs of stakeholders and participants. This blog seeks to open a conversation about the democratization of citymaking and the (applied) right to the city. It is addressed to planners, architects, urban designers, community organizers, artists, students and researchers who see themselves as equal participants in the complex process of citymaking. Here, we will post reflections about this topic, but will also share content and resources that can potentially contribute to creating cities by citizens. We will also post updates of our experiments with open planning and planning-in-situ in urban spaces. We encourage comments that contribute to the advancement of rendering cities truly open, democratic and accessible. Here, you will find posts about urban planning and design, public spaces, community charrettes and workshops, walkability, accessibility, urban sustainability, social movements and community gardens, among others. A variation of the question of 'Where is planning in all this?' that was also recurrent when I presented my research on the square movements was 'What would you recommend the majors or the city planning commissioners of, say, Barcelona or Istanbul, in relation to these square occupations? My response was always the same -- You have thousands of people meeting in public spaces to discuss the future of the economy, politics, sustainability, gender equality, art, cinema and social change. You have people testing new technologies, forms of organization, architecture, sustainable energy and urban design: true urban laboratories in public spaces ... What are you still doing in your offices? ... You're missing out!